Free Serial Analyzer is a non-intrusive Serial Port sniffer and software RS-232/RS-422/RS-485 protocol analyzer for Windows. Using this freeware RS232/RS485/RS422 logic analyzer utility you'll be able to capture and display any data transmitted via Serial Ports of your computer. Captured raw binary data of serial communication packets is decoded, parsed and then represented in easy-readable format, allowing you to perform effective forensic analysis of any data exchanged via RS 232, RS 422 or RS 485 serial interfaces. This free serial protocol analyzer is a complete software serial port sniffing solution, therefore you don't need to worry about any additional hardware, null-modem cable, DB-25 or DE-9 connectors and so on. Using this software Serial Port logic analyzer you'll also be able to capture and monitor dataflow from any serial devices connected to the COM ports of the remote PC. In order to monitor and analyze data streams flowing though remote Serial Ports you just need a Device Monitoring Studio Server and LAN or Internet connection to the remote computer. 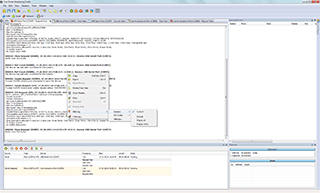 Free Serial Analyzer supports advanced data filtering by Requests and I/O Codes. Use this Serial Port Packet Sniffer for development, testing and debugging of your serial applications and devices. Program installs filter driver over the Windows serial port driver and then monitors all the data transmitted via serial ports by any serial software application or RS-232/RS-422/RS-485 hardware devices. This Free rs232 data explorer and tracer is designed for effective capturing, parsing and decoding, monitoring and analyzing of communication traffic generated by serial devices connected to the local or remote PC. Capturing, parsing and displaying of data transferred via Serial Port connections now made easy! Free Serial Port Analyzer supports all modern Windows server and desktop platforms starting from Windows XP (32-bit and 64-bit) and including Windows 8/8.1 x86 and x64 operating systems. Free Serial Port Analyzer is able to capture and decode monitored packets in real-time even under high traffic load. This Freeware Serial Port Monitor supports all standard Bit rates of 75, 110, 300, 1200, 2400, 4800, 9600, 19200, 38400, 57600 and 115200 bit/s. It is also extremely optimized and carefully tuned to support high transfer data rates and Non-standard bit rates without chance to slow down or stuck your computer or operating system like many others do. Our Free COM Port Analyzer also supports all standard Data bits, Parity (odd, even, mark, space), Stop bits, XON/XOFF Software and Hardware Flow control. It intercepts and traces all Input/Output Control Code Requests (IOCTLs) and I/O Request Packets (IRPs) from DTE (data terminal equipment) and DCE (data circuit-terminating equipment) devices. It displays the status of Serial (Modem) control lines: Transmitted Data TxD, Received Data RxD, Data Terminal Ready DTR, Carrier Detect DCD, Data Set Ready DSR, Ring Indicator RI, Request To Send RTS, Clear To Send CTS. It monitors data from plug and play (PnP) serial ports and I/O ports (COM Ports) interfaced by 16550 UART: COM1, COM2, COM3, COM4 … COMn; custom and virtual serial ports registered and visible in Windows device manager under standard Ports (COM & LPT) device class. It may capture serial port traffic which flows via named pipes created by our Free Virtual Serial Ports. It supports monitoring of exchanged serial data from external devices connected to the PC via USB to Serial converters. If you are looking for complete software solution to view serial port communication traffic and explore serial protocol packets data, Free Serial Analyzer is what you need. This serial port monitoring tool requires no additional hardware and allows you to debug protocol errors, view and test device failures. Download this Free Serial Port Monitor and start to analyze Serial Port communications in just few seconds! Remote. It monitors devices connected to the remote computer.